As marketers, we spend hours of our time each day working on lead generation strategies that engage and convert users. However, most of the attention goes towards attracting and informing these users. We frequently forget about the importance of optimizing and tweaking our contact forms for maximum conversions. In this article, we will look at 10 research based tips and best practices that you can use to improve your contact form conversion rate. The difference between a high converting contact form and a low converting one is often very miniscule. Success is found in the details, and something as simple as choosing red over green could increase a particular form’s rate. The size of your input fields should match the expected length of the answers. In other words, most people have eight or fewer letters in their first name. Don’t make your name input field 20 characters long. Field labels should be placed above the corresponding input fields for quick reference. A form should never be split into multiple columns, and one question per row is ideal. All of these intricacies matter. They help establish a sense of comfort with the audience and avoid unnecessary confusion. This one is pretty straightforward, but make sure the conversion form is located in a conspicuous place. Conversion forms should always be above the fold and should clearly standout amongst the other on-page elements. 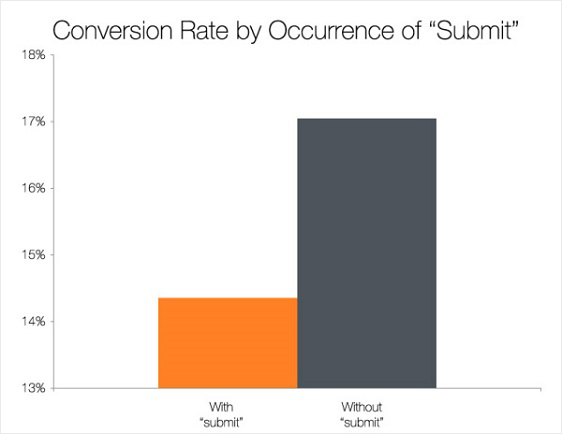 Putting a conversion form at the bottom of a landing page means the majority of visitors will never see it. The last thing you want to do is overwhelm the user. If you can help it, never include more than three fields on your form. According to this infographic by Quicksprout, limiting the number of fields to just three can guarantee a minimum conversion rate of 25 percent. 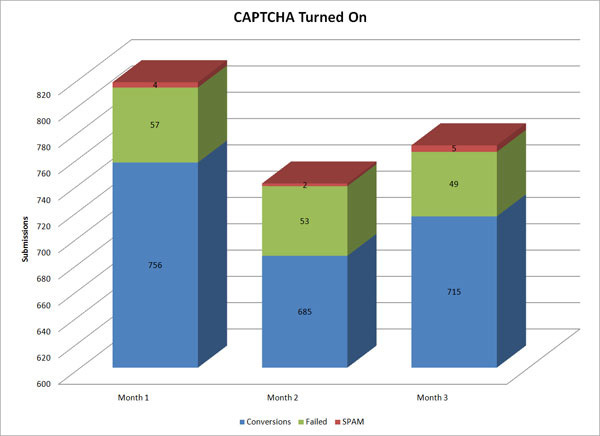 Another study by Hubspot verifies this concept, showing that reducing the number of fields from four to three brings a 50 percent improvement in conversion rate. The color of your CTA button matters. The key is to choose a color that fits your current design and layout, but simultaneously pops out and screams “click me.” According to a number of case studies, red is the highest performing color. However, don’t underestimate orange and green. In certain situations, these colors can perform better. 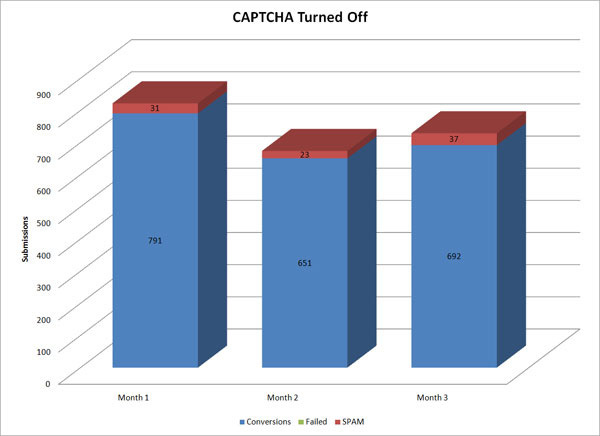 While captchas do a good job of filtering spam, nobody likes them. One study shows that they actually have a negative impact on conversion rates – losing around three percent of total conversions. This isn’t to say you should forget about security. It’s obviously a very important component of building trust. However, if you want to avoid spam, the better solution is to use honeypot technology that WPForms offer to protect you from spam. 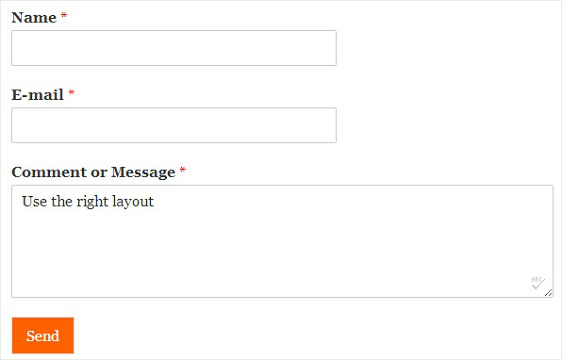 To learn more ways WPForms helps prevent unwanted form submissions, check out this guide to creating spam-free WordPress contact forms. If there’s one piece of information users hate giving away, it’s their phone numbers. Research shows that asking for a phone number leads to high form abandonment in almost every situation. Not only is the phone number an additional field, but users are wary of giving away the information. They already deal with enough distractions and don’t want a persistent sales person calling them every day. If you absolutely must ask for a phone number, give the user a choice. According to this study, changing the phone number field from mandatory to optional decreases abandonment from 39 percent to just 4 percent. As you can see, there’s a lot of flexibility when it comes to social proof. The important thing is that you incorporate at least one element in or around your conversion form. It’ll do wonders for your conversion rate. People don’t want to be left in the dark. They want to know exactly what will happen after they click the submit button. By improving the copy of your CTA or adding another field that tells them what to expect, you can greatly enhance your conversion rates. According to studies, the word “submit” is not descriptive enough. Words like “go” and “click here” see conversion rate increases in the neighborhood of 25-30 percent. Another study shows that if you use first person in the call-to-action button, it improves the conversions by as much as 25 percent when compared to using second person point of view. You shouldn’t be picky with the information you seek. There’s nothing more frustrating for a user than filling out a form and then being told that their birth date had to have forward slashes, not dashes. Just let people fill the form out! Error messages kill conversion rates. There simply aren’t enough people who are willing to fill out a form twice. Ultimately, users need a reason to believe. Why should they give you their information? This all starts with the value proposition. Determining the right reward is key. Does a user really care about being on another email list? No. What they really want to know is what value your email provides them. Clearly convey this value and you’ll experience better results. 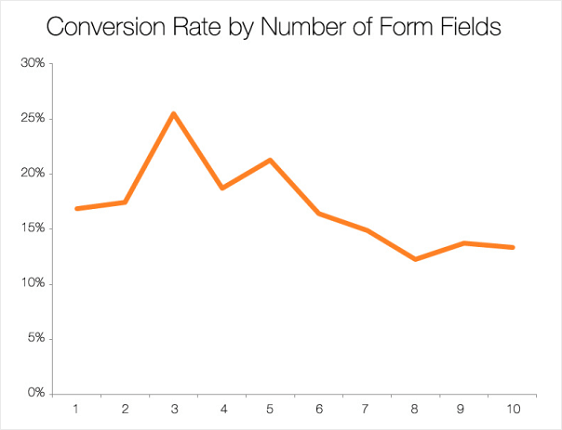 We hope this article helped you learn the form conversion best practices so you can improve your contact form conversion rate. Want some more stats and facts to refer to when it comes to online forms? Check out these 101 unbelievable statistics and facts about online forms. As a marketer, you don’t have time to waste on finicky conversion forms and complicated design tweaks. You know what you want, and you need a tool that will help create powerful forms that convert. Start using WPForms today and improve your contact form conversions. These are some fantastic points – we’ve literally watched some of these in action with heatmap tracking software! Thanks for sharing the research behind what we are seeing everyday! Syed, thank you for these proven tips on form conversions. I would just like to add the increase in response you can see when forms are responsive. Making forms optimized for mobile devices when there are so many poeple that use their phones as their primary means of web browsing is essential. Yes at this time, WPForms doesn’t allow chart reporting. However you can still use it and export the entries in a CSV. What’s the best way to make the form mobile friendly. I use a third party mobile website service through BMobilized and I can’t get the WPform to show a submit button or work properly. Your thoughts. Something about HTML snippet……….? Our forms are automatically mobile-responsive, though some forms look better when there’s only one field per row on mobile (we have a tutorial on that here). What you’re describing, though, sounds like a conflict with the service you’re using (perhaps it’s altering the form’s code in some way). If you could please contact us in support with the URL where this is happening, we’ll be able to help you troubleshoot further from there. Where do I fill in the link to my email when I had a form with the Submit button? Today all answers are to be seen on the homepage, but not in my own mailbox. I’m sorry to hear you’re seeing issues with emails! To check on your notification settings, you can open the form builder and go to Settings » Notifications. The Send To Email Address will determine where emails are sent to (and if you add more than one email address, just be sure to put a comma in between). In case it helps, here’s our tutorial on setting up notification emails. And if these settings look correct but emails still aren’t working, please check out this tutorial on setting up an SMTP plugin where we discuss email delivery issues and solution options. Wow, really helpful. Thank you Syed!